1. Way back when (the Hodgepodge bicentennial to be precise) several of you submitted questions as part of a giveaway I was hosting. I went back to that list for inspiration today and found a question submitted by Marla, who blogs over atMarla’s Musings. Thanks Marla! She asks-At what age did you feel like a ‘grown-up’? What keeps you young now? I wrote about this about maybe seven or eight years ago. The very first time I felt like I’d really become an adult was when I was walking up to the pediatrician with Elliot for his 6 week check up. I had the baby seat in my hand and a diaper bag and I just finally felt like a responsible grown-up. I remember thinking, “This is what parents do.” And to me, that was making it to adulthood. I don’t feel very old most days but I’d say going out with friends and playing with my kids keeps me young. 2. When did you last buy a vehicle? Was this by design or because you had no other option? Was the car/truck purchased for your own personal use or was it bought for someone else to drive? On a scale of 1-10 (with 10 being delightful and 1 being ‘pass the Excedrin’) how would you rate the experience? Well MY last car was purchased in October 2006 because my old one (a ’93 Infinity) was pretty much done for. 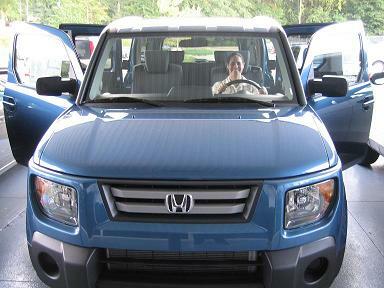 I got it for myself, not thinking much about the future and kids and all; a Honda Element. I would say the experience was straight up a 10. Billy at Honda was awesome, not pushy, and just a nice guy. Now we got Ash a car in December of 2010 because he was in an accident earlier in the year and his car was totalled. We went to Toyota to drive cars comparable to the Honda Pilot and it was a nightmare! We were like prey to those salesmen. They literally tripped over themselves to get to us and before we ever committed, started writing up paperwork. We ended up back at Honda with Billy and bought a Pilot anyway! Hmm, tough one. I really like cornbread but corn on the cob (in the husk, 350 for 30 mins in the oven is also amazing.) 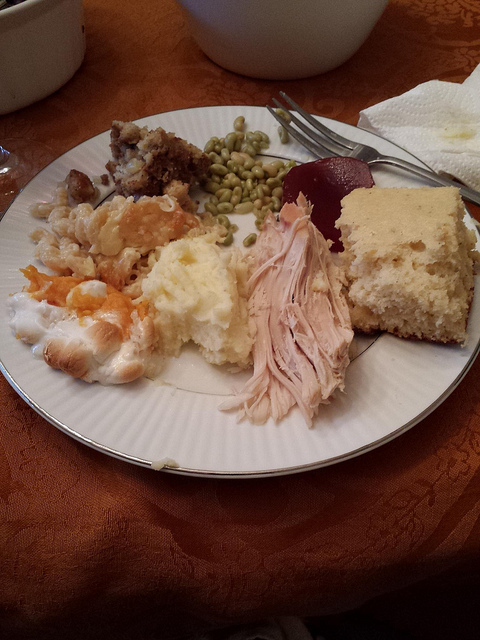 But I prefer sweeter cornbread with my Thanksgiving meal. 4. What’s something in your life that regularly requires you to ‘put your thinking cap on’? My budget! I was just doing it this morning because with Dakota being the only one in daycare and Isaac and Ell going to a different after care program, I knew I was going to save money. I found out I’m actually saving about 460 bucks! But I have to “put my thinking cap on” and write it all out. I’m pretty visual so that is how I figure out things. You know which movie first came to mind? School Ties. It has Brendan Frazer and Matt Damon and it’s about a Jewish kid going to a prep school in the 50s or 60s and the problems with that. I used to love it! 6. Reading, writing, and ‘rithmatic’ are commonly referred to as the three R’s. What are the three R’s in your life right now? Ok so I have to steal one: Reading, but then Running and Readying. I am reading quite a bit while on the elliptical lately but I also need to start running outside again. I am readying my materials for class this coming Monday. My syllabus is mostly done but I have to swap out one paper for another, which requires me to tweak everything ever so slightly. 7. What’s something you’ve learned or tried recently you can say was as ‘easy as ABC’? Hmm, tough one. I mean, I honestly can’t think of anything recently where I said to myself, “That was easier than expected.” Let me just say that it’s coming to terms with Isaac being in Kindergarten. I was worried he’d not know what to do and 5 year olds always look so little standing out there in front of the school. I had a moment this morning while I watched my two boys cross the street to the school where I realized how I don’t feel nervous. So yes, letting him go and grow up has been easy. In 2012, I got asked to do this thing called the Guest Coaches Program over in Athletics. I got to tour the facility, eat at the athletes’ dining hall, sit in on a wide receivers meeting, sit with the admins and ask questions, then watch a practice. THEN, I also got tickets to the Wake Forest game. Well the other night, I got invited again. It’s too bad I skipped the Jameis Winston years but that’s ok. I am just honored to have been asked again. I’m excited; go Noles! You know, I never saw School Ties… I’m going to have to look that one up, because I remember hearing about it when I was a teen and thinking it sounded good, but then never ever saw it. A young Matt Damon? Sign me up! 😉 The first classroom-related movie that came to my mind was Dead Poet’s Society. You reminded me of another movie I liked a lot-With Honors. Also with Brendan Fraser I think, and Joe Pesci…the student loses his thesis and a homeless man makes him buy it back one page at a time. Worth a watch if you haven’t seen it. I remember that one! Also pretty good.